Planning for a relative with a disability. 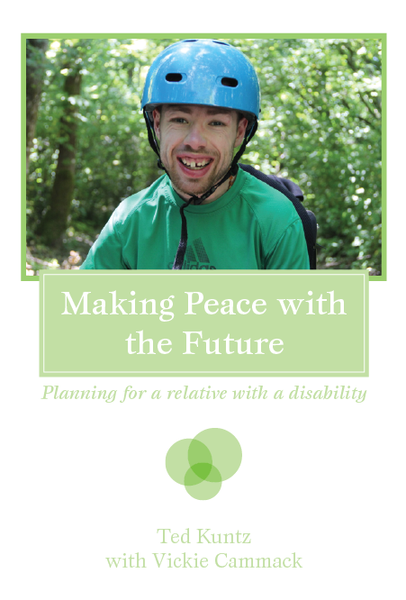 Making Peace With The Future is a collection of stories written by families who have a relative with a disability, for families who have a relative with a disability. The message of the book is simple – those who have lived with and loved a relative with a disability have learned a few important lessons, and the desire is to share these lessons with others to improve the quality of life for you, your family, and your relative with a disability. The book shares stories of inspiration, celebration and hope for the future; its purpose is to illuminate the pleasures, challenges and opportunities each of us face as we seek to secure good lives for our relatives. With each of these lessons the authors share a story, offer reflections, and make suggestions for action. Together these stories, reflections and actions lead to a place where we can have hope for the future and peace of mind in the present. This book hopes to share the authors’ experience with you as we walk toward a common destination: a future that is safe and secure and full of life and love for our loved ones with disabilities. Ted is an author, a college professor and a psychotherapist with a private practice in Vancouver, British Columbia. He has a Master’s Degree in Counseling Psychology and 25 years of clinical experience. Ted and his family became one of PLAN’s youngest Lifetime Members and over the years he has grown to become an active part of the future of PLAN. Ted is also the current Chair of the Board of Directors of Plan Institute and PLAN. Vickie is the Founding Director of Plan Institute, and co-founder of Planned Lifetime Advocacy Network (PLAN), a pioneer social enterprise supporting families to secure the future of their family member with a disability. She is also the Founder and CEO of Tyze Personal Networks and is the Founding Director of the Family Support Institute. Vickie has taught and designed curriculum for colleges and universities, as well as writes, consults and lectures internationally on social networks, organizational transformation and scaling social innovation. She is co-author of ‘Safe and Secure – Six Steps to Creating a Personal Future Plan for People with Disabilities’, as well as being a Fellow with Social Innovation Generation. In 2008, the Women’s Executive Network named Vickie one of Canada’s Top 100 Most Powerful Women, and in 2014 she was appointed to the Order of Canada.